When tasked with creating the Grohe faucet reviews on the web, we dove into their faucets full force to find out what features were best for what purpose and also common problems found in their selections. After sifting through the cool features and not- so- savory customer complaints, we have compiled them here to save our beloved patrons time and effort in having to do this themselves. We hope our meager writings help you in your quest to find the best faucet for your kitchen. For more from Faucet Mag, feel free to check out our list of best-rated faucets. 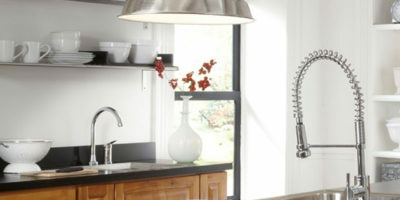 The Grohe Concetto is a pull-down faucet that is beautiful and well made. This faucet also features Grohe’s quick installation system, which leads to freeing your inner do- it- yourself. The solid brass construction allows this faucet to be beautifully formed, and also durable and safe, as brass will not leach harmful substances in your water. The 360-degree swivel allows you to install it with the lever either on the left or the right according to preference. 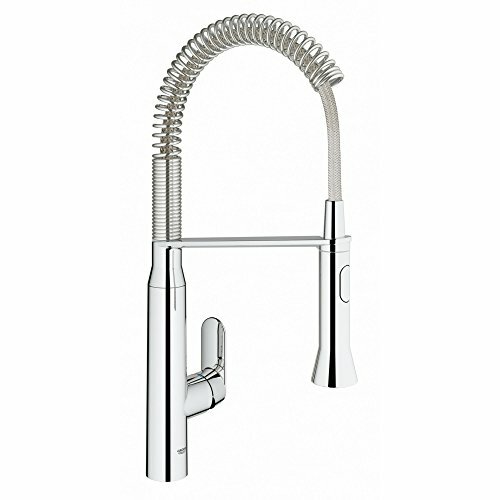 Consumers also raved about the quality and craftsmanship of this faucet. Some were impressed with the stainless steel braided hose, which is more durable and lasts longer than plastic or cloth ones. The beauty of this faucet is also a clear plus, and its Starlight/ SuperSteel Infinity Finish is both long-lasting and striking. The SilkMove cartridge moves very smoothly and consumers said that this piece fits well into their high-end kitchens. It both looks and feels like a quality piece. Over and over, it is reported that this faucet has too many restrictors and that consumers would find themselves removing them to get the pressure and flow they desired. Even worse, some had to hire plumbers to perform this task for them, which cost them money and even sometimes time off work to meet with the plumber. Let’s face it, not everyone has the skill, time, or desire to repair their faucet, and removing restrictors isn’t the simplest process. It should be noted that this model has an advertised 1.7 gallons per minute flow rate and that the decrease in flow actually saves water (which can save money as well). When considering this product, the exchange between flow and conservation should definitely be taken into consideration. The Grohe Ladylux was the first pull out faucet in the USA. The Grohe K7 is a commercial fusion style faucet that features all of the conveniences of an industrial faucet with beauty that makes it look well- placed in your home kitchen. This faucet enables your sink to be as easy to use and productive as the one you would find in a top- of- the- line kitchen at your favorite restaurant. It packs all of the professional punch into a more compact form, so as not to seem out- of- place in your home. 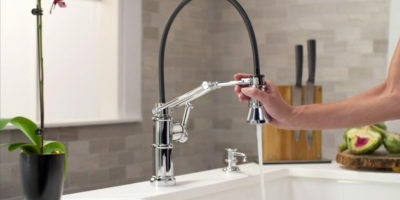 Consumers report that this faucet is extremely easy to install, and can be installed in about ten minutes even by the most inexperienced plumber (this could mean you!). It is reported that the hose works well and stays in place when not in use. This faucet features the Starlight Finish and SilkMove ceramic cartridge that gives it a polished look and feels. If you fancy yourself an amateur chef and pine after the professionals, consider bringing this faucet into your own kitchen to bridge the gap. It was very hard to come across cons for this faucet. Believe it or not, there are no reports of problems with this faucet. This left Faucet Mag editors stunned. 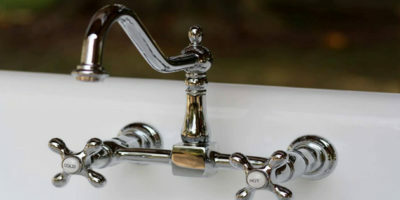 It is very hard to believe that a faucet is so well made that there have never been issues with it. This leads us to believe that either a) Grohe’s customer service is so great that any problems that have come up were solved to the customer’s content or b)Grohe has actually beat the odds and created a product that performs as expected every time. Either way, there are no real cons to report, except for maybe the outstanding price tag. But hey, if it works this well, it may be worth it! 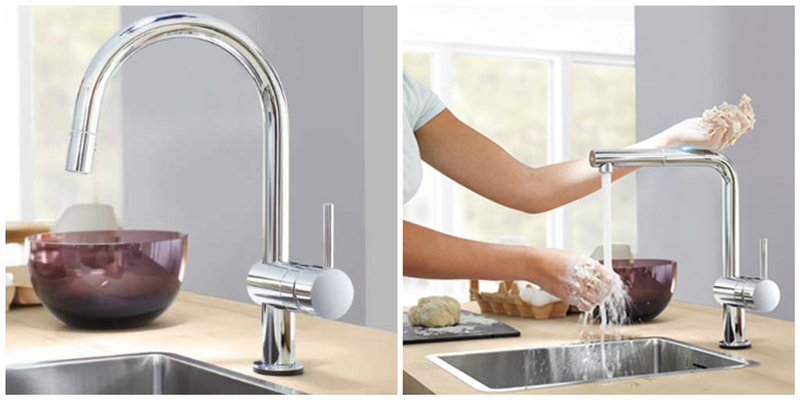 The Grohe Eurodisc is a premier pull- out faucet that fosters ease of use for you and your family. 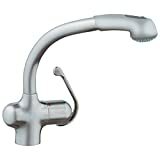 This faucet is easy to use, ergonomic and has lots of cool features. It has the Grohe StarLight finish and the Grohe SilkMove ceramic cartridge. It also has the SpeedClean anti-lime system. With all of the cool features of its more expensive cousins, this faucet has the added bonus of fitting into smaller budgets. It has a low profile and a solid feel to it. It has the same solid brass in it that the most expensive cousins have as well. It even has the locking dual- spray function like the similar Ladylux that is much more expensive. 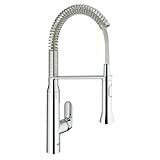 Overall, it is safe to say that Grohe did not skimp on this faucet because of the price. 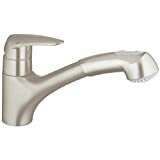 Rather than simply being cheap and of less quality, this faucet is a good piece at a good price; a true bargain. There were a lot of complaints about this model. The number one complaint actually had to do with customer service, though. Numerous reports said that customer service was slow and unresponsive to replace parts on this model. Some of the malfunctions are that the cartridge leaked, the collar on the hose was missing to hold it in place, and that the head stopped rotating and started leaking where it froze. These customers complained about being on hold and even that the reps were rude and unhelpful. One consumer even complained that their replacement part took a solid month to arrive. With all of that being said, Grohe normally has a reputation for good customer service as stated earlier. 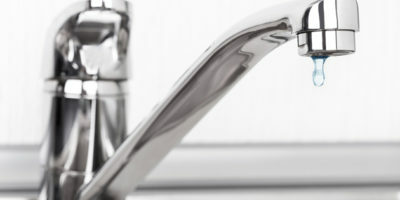 As far as the leaks are concerned, you will find that it is a common complaint about this type of faucet to have an issue or two occasionally. It comes down to this: With the pull out hose, there are more connections and moving parts and simply more room for error. If you really want the feature of a pull- out faucet, just keep this in mind. Grohe is probably better known for their bathroom fixtures, but skills learned in the bathroom are put to good use in the kitchen as well. After all, both have a similar focus in being that they provide water to the house in a needed area. Both can also be a place that expresses your personal style, and Grohe has the design team necessary to help you achieve that. As a matter of fact, in 2012 Grohe won the red dot ‘design team of the year’ award. If you take a look at their list of awards, you’ll see that they have won a number of awards for design. With headquarters located in Dusseldorf, Germany, Grohe also has a presence in over 130 other countries, and they put classic German engineering to good use. With the latest technology, they know what features work, and how to make them work. The people in the company responsible for this aspect are called “Masters of Technology”, and they are indeed masters. They are on the cutting edge of technology, often crossing over into “inventor” territory. They boast 140 years of being “Masters in Technology”. With all of their products backed by a limited lifetime warranty, you can rest assured that you are covered for any malfunctions. You may not ever find yourself needing to use this warranty, as the company boasts that their faucets actually last a lifetime. Although there are conflicting reports on the quality of their customer service, the warranty page has a simple form to fill out online to make claims. With their base being in Germany, replacement parts can be expected to take a little long occasionally, but with the quality Grohe boasts, it may be worth the gamble. Like already stated, you most likely will never have to use the warranty at all. Overall, Grohe is a great company with high standards. 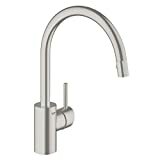 They have a wide array of faucets and are sure to have a fit for most kitchens. 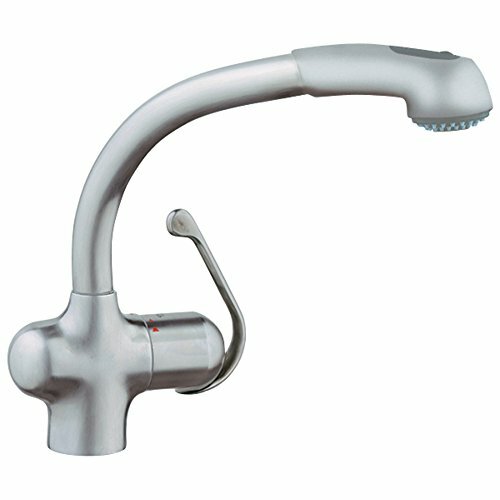 Reviewed here are two pull- out faucets, the higher- end and durable Ladylux and the more budget-friendly Eurodisc. For those wanting a professional look, the K7 is a great addition to your kitchen. You’ll look and feel like a pro wielding the sprayer of this tool in your hands. For the professional functionality without an industrial look, the Concetto is a nice pull-down faucet that has a lot of the same features as the K7. It also has a smaller price tag, which is always a bonus. All in all, we hope these Grohe faucet reviews leave you with a clear picture of Grohe and the faucets they offer.